1 of 3 Heat cream in a heavy-bottomed medium-size saucepan over medium-high heat until bubbles form along edge. Lower heat to medium-low and stir in both sugars, cocoa, butter, chocolate, espresso powder and salt. 2 of 3 Continue to heat over medium-low heat, stirring constantly, until smooth and sugars are melted, about 10 minutes. Take off heat and stir in the coffee liqueur and vanilla. Allow to cool; store in airtight jars in refrigerator for up to 2 weeks. When serving, reheat gently. 3 of 3 To present as a gift, wrap the tops of the jars in festive fabric and secure with ribbon; keep refrigerated until ready to give. 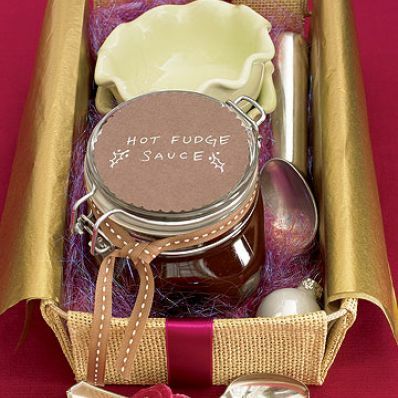 Nestle in a tin filled with netting and include a whisk, wooden spoons and premium maraschino cherries.